“Whistleblower” anti-retaliation protections under the 2010 Dodd-Frank Act only apply to employees who actually report information to the SEC, according to a unanimous U.S. Supreme Court in its February 21, 2018 Digital Realty Trust, Inc. v. Somers ruling. There, an employee reported suspected securities law violations to his supervisor, but he never reported his suspicions to the SEC. The employer later terminated the employee, and the employee sued for retaliation. Although the lower courts found that the whistleblower protections did apply, the Supreme Court disagreed, holding that the employee’s internal report did not qualify for protection under Dodd-Frank. Dodd-Frank’s whistleblower protection regime uses a two-step process. First, it says that “whistleblowers” are eligible for protection from retaliation, and defines a “whistleblower” as a person who reports a securities law violation to the SEC. This definition says nothing of those who report violations internally to their employers. Second, Dodd-Frank lays out what activities are protected, including providing information to the SEC, participating in an SEC investigation, and reporting a securities law violation to one’s supervisor. The employee in Somers argued that, because he was a whistleblower in the ordinary sense of the word (i.e., he reported a suspected violation of the law), and because he engaged in what he termed a “protected activity” (i.e., reporting something to his supervisor), he should be protected from retaliation under Dodd-Frank. 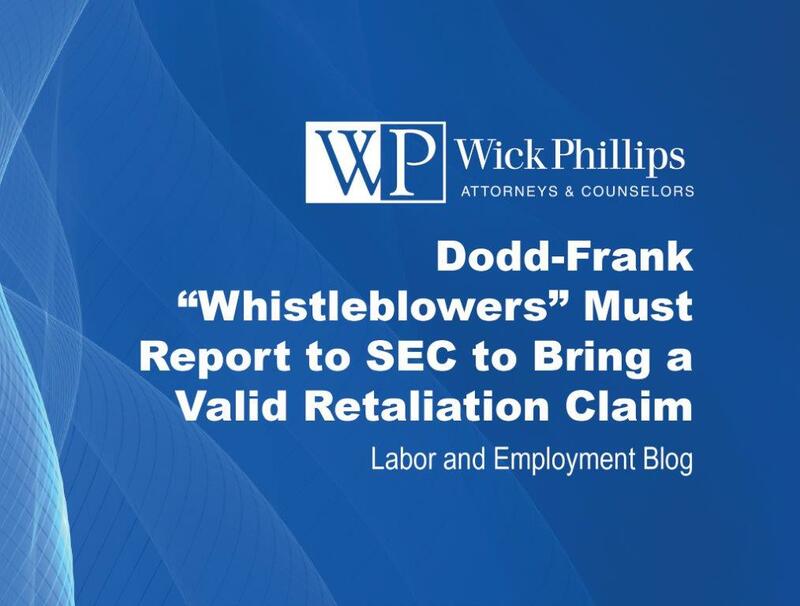 The employer, however, argued that because the employee never actually made a report to the SEC, he was not a “whistleblower” eligible for protection, since he did not satisfy the first part of the two-step test. The Supreme Court sided with the employer, holding that the clear definition of “whistleblower” provided by the statute must prevail. Thus, the Court held, the employee was not eligible for protection from retaliation because he never actually reported the violation to the SEC. 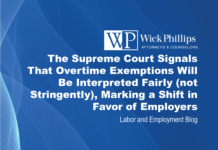 Although this ruling could be seen as a “win” for employers, it is still unwise to retaliate against employees for internally reporting violations of the law. In addition to potential bad publicity, the employee may still be protected by a different statute’s anti-retaliation provision. For example, the employee may have made a report to the SEC without the employer’s knowledge, or the employee may be protected from retaliation under the provisions of the Sarbanes-Oxley Act or another securities law. As an aside, the consequences of unlawful retaliation under Dodd-Frank can be severe. A wrongfully terminated employee can directly sue the former employer within a lengthy six-year statute of limitations. And, if the employer loses, it must pay the employee double backpay with interest, reinstate the employee, and pay the employee’s litigation costs, expert witness fees, and reasonable attorneys’ fees. The employee also gets a cut of any fine levied by the SEC for the underlying securities law violation. The takeaway: This ruling helps to clarify Dodd-Frank’s scope, however, anytime an employer has knowledge of a soon-to-be terminated or disciplined employee’s internal complaint, it is best to proceed cautiously.